Environmental judicial review is dominated by land use planning decisions. This is no surprise given that it is by far the most common public decision-making in environmental law. 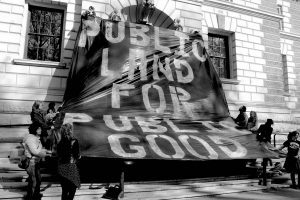 Currently in London and indeed around the UK planning law impacts the lives of many particularly in relation to community use of land, open space, and ‘regeneration’ often forcing working class communities from an area they call home. Displacement is occurring across London, and indeed across sought after areas throughout the country, it is central to the process of gentrification. Therefore, the importance of law in both resisting such displacement is often overlooked. It is important to understand that decisions on planning that affect your community, or council estate, are potentially open to challenge. Planning Law: Development or Gentrification? This state-led redevelopment, enthusiastically endorsed by many local councils, has been instigated at the behest of national policies which is being driven through locally, and is based on private finance and large building companies to ‘regenerate’ council estates. For many communities this is code for gentrification, and ultimately being forced out. In order to pioneer, and accelerate that process the government has launched a £150 million Estate Regeneration Programme of loans to private developers for ‘redeveloping existing estates’ on ‘a mixed tenure basis’ continuing the idea of a ‘mixed-community policy.’ As a result it is a housing strategy locked into a strategy that calls for the “vast development potential in London’s existing affordable housing estates” to be unlocked through private redevelopment. For many exiting council tenants, and for those who seek to defend the state provision of genuinely affordable housing this effectively means that state assets are being conceded to the private sector. It is said that no-one will lose their home – but for many who have fallen victim to these promises, it means that council estates that housed hundreds, now only house handfuls of council tenants. Generally across the country, but London in particular, planning permission is granted to ‘regenerate’ estates and local areas. This fails to have local community at the centre, often they are pushed to the periphery. Often this leads to exclusion, as promises that are made do not materialise. There is a plethora of complex planning laws, rules and regulations. Nonetheless, national and local councils need to act lawfully. If they don’t act lawfully then decisions on ‘regeneration’ and ‘investment’ strategies can be challenged. Planning decisions can be appealed to the planning inspector. Those decisions can be appealed, and ultimately planning decisions can be challenged in the courts if there is evidence that the process by which the decision was made was unlawful. Whilst a court challenge can be complex, lengthy and costly – backed with a solid and vigorous community campaign, it is increasingly becoming an essential part of a strategy to defeat these ‘regeneration’ plans. A useful guide to challenging planning decisions can be found here. Judicial review is the legal process by which you may challenge the lawfulness of a decision by a public authority that impacts on you or your interests. Judicial review is exercised by High Court judges under the Civil Procedure Rules, Part 54. Such challenges apply to public bodies, such a a local council, or for instance the Mayor of London. It can also include Planning Inspectors, the Secretary of State, and statutory agencies such as the Environment Agency. It can also cover decisions by Parliament if contradictory to European Union Law or Convention (e.g. the European Convention on Human Rights). An application for permission for a Judicial review normally has an absolute deadline of 3 months. However strict time limits apply to both statutory reviews and judicial review. Under s. 288 of Town & Country Planning Act 1990, applications for review must be made within six weeks of the date of the decision. So it is important to act promptly – if in doubt seek advice early.